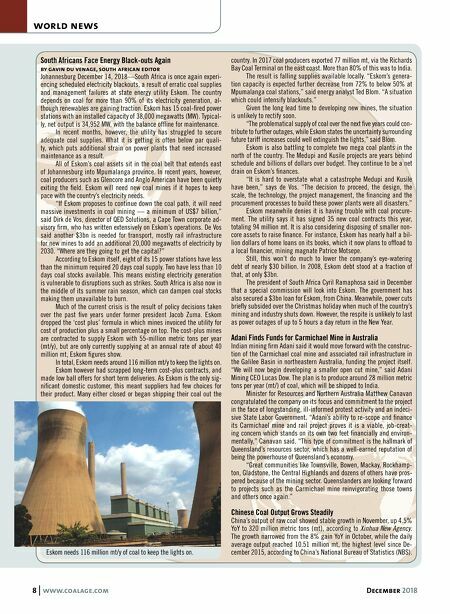 8 www.coalage.com December 2018 world news South Africans Face Energy Black-outs Again by gavin du venage, south african editor Johannesburg December 14, 2018—South Africa is once again experi- encing scheduled electricity blackouts, a result of erratic coal supplies and management failures at state energy utility Eskom. The country depends on coal for more than 90% of its electricity generation, al- though renewables are gaining traction. Eskom has 15 coal-fired power stations with an installed capacity of 38,000 megawatts (MW). Typical- ly, net output is 34,952 MW, with the balance offline for maintenance. In recent months, however, the utility has struggled to secure adequate coal supplies. What it is getting is often below par quali- ty, which puts additional strain on power plants that need increased maintenance as a result. All of Eskom's coal assets sit in the coal belt that extends east of Johannesburg into Mpumalanga province. In recent years, however, coal producers such as Glencore and Anglo American have been quietly exiting the field. Eskom will need new coal mines if it hopes to keep pace with the country's electricity needs. "If Eskom proposes to continue down the coal path, it will need massive investments in coal mining — a minimum of US$7 billion," said Dirk de Vos, director of QED Solutions, a Cape Town corporate ad- visory firm, who has written extensively on Eskom's operations. De Vos said another $3bn is needed for transport, mostly rail infrastructure for new mines to add an additional 20,000 megawatts of electricity by 2030. "Where are they going to get the capital?" According to Eskom itself, eight of its 15 power stations have less than the minimum required 20 days coal supply. Two have less than 10 days coal stocks available. This means existing electricity generation is vulnerable to disruptions such as strikes. South Africa is also now in the middle of its summer rain season, which can dampen coal stocks making them unavailable to burn. Much of the current crisis is the result of policy decisions taken over the past five years under former president Jacob Zuma. Eskom dropped the 'cost plus' formula in which mines invoiced the utility for cost of production plus a small percentage on top. The cost-plus mines are contracted to supply Eskom with 55-million metric tons per year (mt/y), but are only currently supplying at an annual rate of about 40 million mt, Eskom figures show. In total, Eskom needs around 116 million mt/y to keep the lights on. Eskom however had scrapped long-term cost-plus contracts, and made low ball offers for short term deliveries. As Eskom is the only sig- nificant domestic customer, this meant suppliers had few choices for their product. Many either closed or began shipping their coal out the country. In 2017 coal producers exported 77 million mt, via the Richards Bay Coal Terminal on the east coast. More than 80% of this was to India. The result is falling supplies available locally. "Eskom's genera- tion capacity is expected further decrease from 72% to below 50% at Mpumalanga coal stations," said energy analyst Ted Blom. "A situation which could intensify blackouts." Given the long lead time to developing new mines, the situation is unlikely to rectify soon. "The problematical supply of coal over the next five years could con- tribute to further outages, while Eskom states the uncertainty surrounding future tariff increases could well extinguish the lights," said Blom. Eskom is also battling to complete two mega coal plants in the north of the country. The Medupi and Kusile projects are years behind schedule and billions of dollars over budget. They continue to be a net drain on Eskom's finances. "It is hard to overstate what a catastrophe Medupi and Kusile have been," says de Vos. "The decision to proceed, the design, the scale, the technology, the project management, the financing and the procurement processes to build these power plants were all disasters." Eskom meanwhile denies it is having trouble with coal procure- ment. The utility says it has signed 35 new coal contracts this year, totaling 94 million mt. It is also considering disposing of smaller non- core assets to raise finance. For instance, Eskom has nearly half a bil- lion dollars of home loans on its books, which it now plans to offload to a local financier, mining magnate Patrice Motsepe. Still, this won't do much to lower the company's eye-watering debt of nearly $30 billion. In 2008, Eskom debt stood at a fraction of that, at only $3bn. The president of South Africa Cyril Ramaphosa said in December that a special commission will look into Eskom. The government has also secured a $3bn loan for Eskom, from China. Meanwhile, power cuts briefly subsided over the Christmas holiday when much of the country's mining and industry shuts down. However, the respite is unlikely to last as power outages of up to 5 hours a day return in the New Year. Adani Finds Funds for Carmichael Mine in Australia Indian mining firm Adani said it would move forward with the construc- tion of the Carmichael coal mine and associated rail infrastructure in the Galilee Basin in northeastern Australia, funding the project itself. "We will now begin developing a smaller open cut mine," said Adani Mining CEO Lucas Dow. The plan is to produce around 28 million metric tons per year (mt/) of coal, which will be shipped to India. Minister for Resources and Northern Australia Matthew Canavan congratulated the company on its focus and commitment to the project in the face of longstanding, ill-informed protest activity and an indeci- sive State Labor Government. "Adani's ability to re-scope and finance its Carmichael mine and rail project proves it is a viable, job-creat- ing concern which stands on its own two feet financially and environ- mentally," Canavan said. "This type of commitment is the hallmark of Queensland's resources sector, which has a well-earned reputation of being the powerhouse of Queensland's economy. "Great communities like Townsville, Bowen, Mackay, Rockhamp- ton, Gladstone, the Central Highlands and dozens of others have pros- pered because of the mining sector. Queenslanders are looking forward to projects such as the Carmichael mine reinvigorating those towns and others once again." Chinese Coal Output Grows Steadily China's output of raw coal showed stable growth in November, up 4.5% YoY to 320 million metric tons (mt), according to Xinhua New Agency. 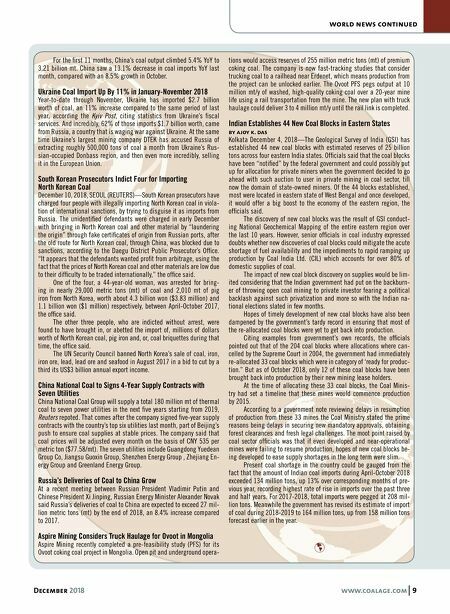 The growth narrowed from the 8% gain YoY in October, while the daily average output reached 10.51 million mt, the highest level since De- cember 2015, according to China's National Bureau of Statistics (NBS). Eskom needs 116 million mt/y of coal to keep the lights on.